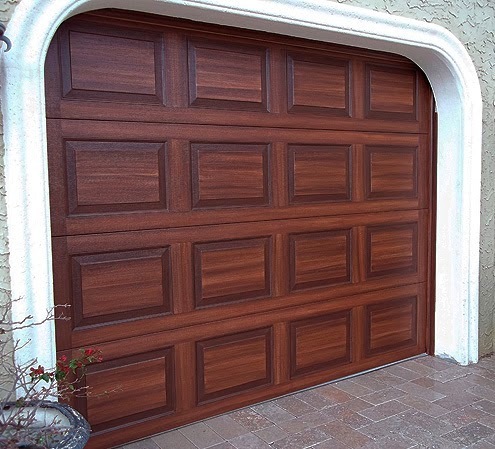 You cannot match the beauty of a wood garage door. The garage door in the photograph above started out as a typical white garage door. I painted it to look like wood and I can show you the process I use to create this look in a complete step by step ebook tutorial that is 132 pages filled with dozens of photographs and approximately 2 hours of videos. The complete step by step tutorial is only $10.00, click the button here: You can purchase with your own credit card or with PayPal. To use your own credit card when you click to 'checkout' there is a link to use which is below the login for PayPal. Here is some good information about downloading the ebook. Consider this, when you drive down the street in a residential area one of the main architectural features you see on each home is the garage door. They are mostly white or painted the color of the house. 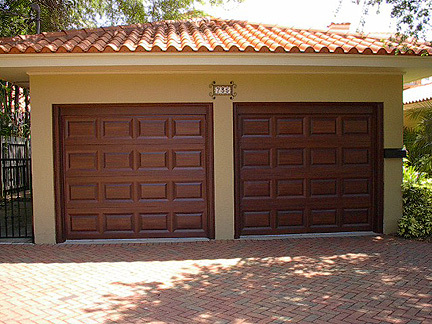 To have your garage door look like the richness of a real wood door enhances the appeal of your entire home and wins the admiration of the whole neighborhood. Many people have written to me asking about the procedure to faux paint their garage door to look like wood. This tutorial explains as best I can the way I go about painting a steel paneled garage door to look like wood. I have successfully painted dozens of garage doors since 2006 using this technique. The tutorial is offered in an ebook format and to watch the videos you need an internet connection. 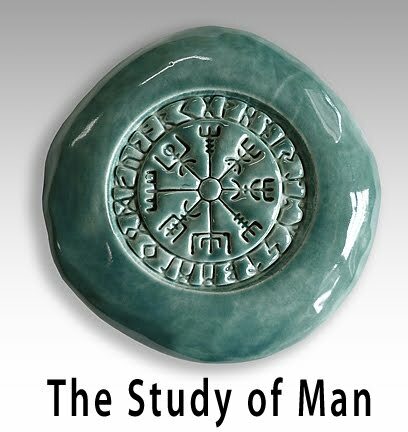 It is a pdf and you can view the book on your computer, laptop, tablet or phone. The book guides you through the entire process in a detailed step by step approach that explains all the little tips and tricks of achieving a professional looking job. Here is a look at the contents of the ebook. I go over all the supplies you will need and the type of paint I use. I show the 'set up' of how I use the paint trays and water containers. I talk about the only type of tape I use and why. You will find out the only type of clear sealer to use and why. In this chapter you will find out how to create a sample board to practice on and why that is a great idea. I show how to set that up and what to use. There are 5 videos in this chapter and photographs to help explain the process. Garage doors are outside so guess what they get dirty. In this chapter I explain how best to clean the door and why even a brand new door needs to be cleaned properly before painting. In this chapter you learn the exact best technique by using a small roller and a brush to prime and then apply the base coat color of paint. There are 2 videos with this chapter. You can not successfully paint a garage door to look like wood unless you understand the way to tape off the different areas of the door. There are 9 videos and many supporting photographs to explain in great detail all the aspects of taping off the garage door. This chapter demonstrates the best practice to save time and money taping off all the various areas of the garage door. I cover every aspect of painting a garage door to look like wood in this chapter. All the little tips and tricks I use to get the professional looking results are talked about and shown in video and still photographs. There 19 photographs and 27 videos in this chapter alone, the information is exhaustive in its reach and completely understandable to anyone. I cover the wood graining process, 'picture framing' the panels and applying the UV clear coat. I explain how to handle the area that is under the weather strip and what I do with the seam between the rows of panels. You can not paint a garage door in direct sunlight and expect it to work out. If the door is not in the shade you need to make your own. This chapter explains how I go about that. This chapter is a gallery of photographs depicting garage doors and front doors I have painted to look like wood. Here is a variation on the most standard garage door profile. 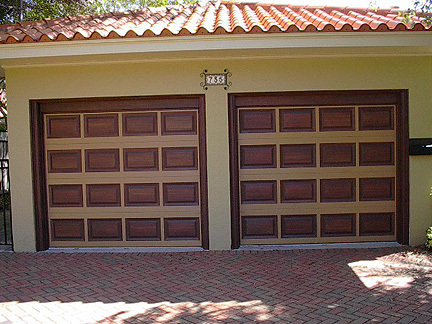 It is almost the same as your standard looking garage door but has vertical planks in the center panels. I will show you how I go about painting this type of profile of door to look like wood. This next photograph is a sample of how I tape off the garage door to get it ready to paint on. I go over all the aspects of taping off a garage door in chapter five. Here is a link to one of the short videos that fill the ebook. It shows you how I tape off the end of each panel. This next photograph shows a garage door with the first coat of brown painted on. The colors I used on this door are a base coat color Tatami Tam, Then the first coat of brown is Fiery Brown then the second coat is Turkish Coffee. All Sherwin Williams colors. Here with the second coat you on in the next photograph you can see the difference it makes. Here is a short video showing the actual painting technique. This is how the ebook is put together. I have written instructions, lots of photographs and about 2 hours of video that is broken up into short video clips explaining each step of the process very clearly. I paint all the rows of panels in first then the horizontal space between the panels and then the vertical space on each side of the door. I the next two photographs you can see how the rows of panels are done then the second photo shows the completed garage door painted to look like wood. After the garage door is completely painted to look like wood I apply a UV clear coat on top to give the job a professional look and a very long lasting life. I go over that in chapter six also. 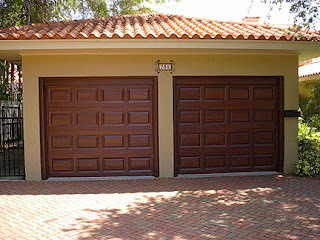 The next three photographs show two single car garage doors I painted to look like wood. In the first photo I have already painted on the base coat of paint. The second photo shows the panels painted and the trim around the doors. The third photo shows the completed garage doors painted to like wood. I also use the exact same painting procedure when I paint front entry doors to look like wood. The double entry doors in the next photograph where painted a dark green before I got there. I painted them to look like wood using the all the same techniques outlined in the ebook tutorial. I wrote the tutorial keeping in mind that the average homeowner can read it and watch the videos then create a beautifully, rich looking wood garage door for their own home. 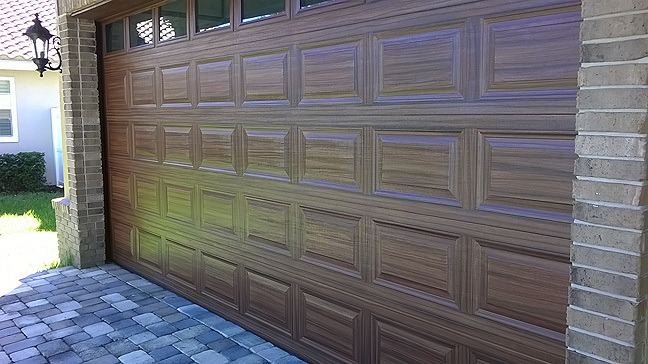 It does take a little time and patience but dozens of homeowners have successfully transformed thier garage doors into fantastic looking 'wood' doors by following my instructions and you can too. Also, if you are a professional faux painter or painting contractor and would like add the ability to transform an average looking garage door into a thing of beauty then give this book a try, you will not be disappointed. I love this tutorial and have shared it with many friends. I used your instructions to complete my garage doors and I love the way they turned out! Thank you so much for such great detail! Thanks so much for this awesome tutorial. If I want to get a walnut finish, what color combination should I use? For walnut I use the SW toasty color as a base then the SW Java for the brown. You can either mix some black with the Java brown for the second pass or use the SW turkish coffee for the second pass. What sheen do you use? Satin, glossy, flat? I like the satin sheen for my garage doors. The semi-gloss just seems too shiny for me and most of my clients agree with me. Thanks Robert for the awesome tutorial. I followed your instructions and my garage door came out great. All my neighbors are impressed! Hi Robert, quick question on the picture framing step. Do you thin out the darker paint mix before applying it to the door, or do you just apply the paint without diluting it? Funny you should mention that. Check out today's post. 12-29-2012. Should answer your question. Can't seem to find the 12-29-2012 post. Wow great tutorial! very excited to give it a try with these step by step instructions how could I go wrong. Thanks for posting this! Would it be ok to spray the base coat? Yeah, you can spray the basecoat but the most important thing about the basecoat is to make sure the door is clean. I really scrub my doors well before I put anything on them. Hi Robert. Thank you so much for these instructions. My garage turned out beautiful if I say so myself. I was asked for my business card if that's any indication of how professional it looks.i will be sealing tomorrow. Before I do that.....do you tape the door the same way as when painting. Also....what type of brush for the sealer...staining or regular? Thank you so, so much! I am so happy your door came out great. No, I do not tape off when using the clear sealer and I use a 2.5 inch angled Purdy brush for that. Purdy has different catagories for their brushes and I use the one for latex paints. Hey Robert! Awesome tutorial. just went and got paint, looking forward to giving it a go, hoping for the same awesome results! I did first cleaning of door with ammonia/water and have a few questions. The first being, it appears as though there was egg that dried on the bottom of the door and had stripped the paint and sort of changed the texture, is there anything special i should do or will the primer/faux finish cover it ok? Any recommendations? Second question, do you paint between the horizontal panels when you raise/lower it? And lastly, where do you get the clear coat? i didn't see it at home depot? Claire, not sure what to say about the 'egg' issue. I would sand it and then carry on with the primer and base coat paint. I do not paint between the rows of panels. Typically when the door is closed that seam is pressing against each other and if you paint acrylic paint in there it will stick together. Then when the door opens some of the paint will pull off and you will see white spots. I won't say I have never done it but as a rule I do not. When I have done that in the past this is the way I go about it. Raise the door so you can get it to where you can paint that area between the panel rows. Then I just paint it a solid dark brown and wait for it to dry which can take several hours. After it dries I take grease and a rag and spread grease on the area. That way when the door is closed it will decrease the chance of the paint sticking together. That's the only way I have ever figured out to paint those areas but its not a good idea unless its your own door and you want to try it. Just remember never use an oil based product. check out the job I am on now --- http://www.everythingicreate.com/2013/03/started-painting-on-new-garage-door-to.html --- to see what happens when you put an oil based product on a garage door. I am having a hard time deciding between mahogany, cherry, and walnut. My wife doesn't want red tones so I think cherry is out. I am having a hard time seeing the difference side by side. Is it possible to post three close up pictures side by side of all three colors to see the shade differences? That's a good idea to post side by side pictures but it might take me a while to go thru my pics and find what I need. I am working on a garage door this week and the client does not want it to red either but a walnut would be to much in the yellow direction. So I am using SW Terra Brun for the brown wood color over SW Smokey Topaz. It will be less red than using the Fiery Brown. The best thing to do is do samples. You can buy a sample qt at SW for like 6 bucks. Don't ever use that on the door but to see for samples its fine. The other issue is actually getting a real true reflection of the color in the first place considering the whole digital thing of camera and differences in screens, etc. However, a side by side will be something I am going to look into for this tut. In current posts you speak of the Modern Masters clear coat. Besides being hard to find locally it seams to be very expensive online. In past post you speak of Varathane Spar Urethane Waterbased which you said is available at Lowes. Is this still available and a good product? I can get the Modern Masters about 30 miles from home, but Lowes is about 2 miles. Which would be a better choice? I am also covering 2 - 9x7 garage doors, a front door, and maybe a side door, how much clear should I need? After using the Modern Master's Masterclear Supreme I would not use anything else. It is just so superior to any other product out there and yes it is pricy. I no longer use the varathane at all. Not sure if you could get away with a quart for 2 single garage doors or not but you might. You only need one coat. Here's the thing about using the expensive mm masterclear. I use it because I am a professional and I am charging money for my work. I always go the extra mile and use the best products I know of and do the extra work to make sure its the best job for the client I can possibly do. I do this because I think its the right way to go about my business and because its part of my marketing plan. My marketing is all word of mouth. I am working on 2 single garage doors this week myself and I got the job from a referral of a garage door job I did 4 months ago. If you are working on your own garage door and using the SW Superpaint with the 25 year warrenty you do not actually need to put a top coat on. In my opinion it looks better when you topcoat and will absolutely give you better performance but its not necessary. As an example I painted my own garage door about 5 years ago and never top coated it with a clear coat. I just decided to do that about 3 months ago so I washed the door down and put the mm masterclear over it. It looks better with a clear coat over it but it looked great anyway so its up to you. I am just saying if you want the best look and the best performance use the masterclear and you will be happy, especially if your door gets a lot of direct sun on it and if you are charging money for your work in my opinion its absolutely necessary to use the masterclear. Hi Robert, is there a special brush you use for getting the graining look? I don't use a special brush. My favorite brush is an angled 2.5 inch one. I mostly use a Purdy. The harder you press the brush against the surface the more the bristles spread out and that will give you a grain look. Just to clarify, you are not using any type of glazing liquid, you are simply creating a transparent glaze by mixing water with the darker colors? I do not use any glazing liquid at all, I only use water to thin the paint. Thank you soo much for this tutorial. Have you ever done a ebony door? If so how did it turn out. What colors would you use. I want a really really dark brown look. Thanks for your help. Talie, I have never tired an ebony color door but if I did I would most likely use SW Java as a basecoat color and SW Black Bean for the wood color. I would do a sample board first to get it right. Hope this helps. Outstanding work and tutorial, Robert! Today our new white-colored garage door has been installed. I will attempt to follow your instructions (sometime mid-summer) and post your tutorial on our site for extra exposure to direct to your site. Robert, on your two toned door, what colors did you use for the lighter, trim colors (on outer egdes)? Love your work! Totally doing this to my unbelievably ugly doors! I painted the base coat color of Tatami Tan a Sherwin Williams color on the entire door. Then I used Fiery Brown but on the lighter areas I used it very lightly. Really? Looks so much lighter. Thanks!! Really impress your blog content thanks. Great tutorial! I have been looking for something like this for a while so thank you for your willingness to share your expertise. My garage doors are my next project as its too hot here to start it now..
You are welcome everyone. I know what you mean about being hot. One of the first pictures in this tutorial shows how I put up a shade tarp for those sunny days. This is awesome! I've been looking at tutorials today and found yours amazing. I did see one using a wood graining tool for the grain, so I'm going to try a hybrid of that method and yours to see how it turns out. I hope the color will still be as rich as your method gets it. Even if it doesn't turn out how I'd like, I'll do use your method and it'll still be a win-win! In my opinion using the gel stain and spar varnish is a bad idea. I have never seen it last and its a mess to strip off and start over. I have been using my technique for over 8 years and never had a cracking and peeling problem reported back to me. Ok, I will give your technique a shot. Do you recommend priming the fiberglass? I always wash down the doors really well and rinse them off really well first. Then I always prime before applying the basecoat paint. I typically use the multipurpose primer from Sherwin Williams. It comes in a deep base so I have them tint it to a P6 dark gray. You could get 2 entry doors with one quart. Then for most doors I use SW 'Toasty' as a basecoat color. Again one quart would do 2 entry doors. By using the dark tinted primer you only need to apply one coat of base on. By the way for entry doors its much easier to take off the door handles when you do the wood graining passes. How would you recommend doing a flat old Masonite door? It doesn't have the nice paneled look. I think it could still look good, just unsure how to do such long strokes?Thanks!!! Yes, long strokes can be a challenge. If you look on my regular website at http://www.wallscomealive.com/pages/garagedoor-1.html about halfway down there is a door with long horizontal strokes. One thing you could do is try to keep the area you are going to paint moist by either wiping a damp cloth across it immediately before you put the brush on it or mist it with a hand held sprayer. You can work long strokes as long as the paint remains wet but once it starts to dry things get difficult. Hope this helps. I paint around window frames the darker color to 'picture frame' them. Thank you for your wonderful tutorial. This is, by far, the best I have found. I wanted to see if you could give some suggestions on paint colors for my garage door. I have a red oak front door finished with two coats of Minwax Early American (230) stain and polyurethane. We used the same finish on the two pine posts that are on either side of the door and they match really nicely. Any suggestions on paint colors to use on the garage door? I understand that I will need to tweak them a little to get the match we are looking for. Thanks again!!! Looking at the minwax website I would say to use SW Tatami Tan as a base coat color then SW Java as the brown and then mix black with the Java for the second pass. But looking at the early American stain I would go very lightely with the brown color over the base coat. *my local SW store did not carry the Superpaint in quarts, but do have the Resilience. What are your thoughts on that product? *I decided upon combination of Tatami Tan and Fiery Brown,as used in the tutorial, but it is so hard to really see the difference between colors on your pictures. Plus it seems recently you have added more color combos than in the tutorial. Have your preferences changed? Resilience is great. I know SW does not sell the exterior superpaint in quarts anymore. I do so many doors I always buy the gallons. As far as color goes. I basically use only three or four different color schemes depending on the home and if I am trying to match a front door. I either use SW Toasty as a base or SW True penny. With the true penny I only use the fiery brown over it. That gives you a real redish brown look. With the Toasty I mostly use Fiery Brown over it and it looks like mahogany to me. Sometimes I use SW Java and that looks like walnut to me. And sometimes for a little less redish look from the fiery brown but not a walnut look I use SW Terra Brun. Hope this helps. Of course you realize the color of photos over the internet is affected by the camera which took the pictures and the monitor you are seeing them on. I have an hp pc which I work on and I recently saw my site on a mac and there was a major difference in the color. That is why I always recommend doing a sample board. SW sells sample quarts for like 5-6 bucks. Robert, since SW still honored their 30% off promo for me yesterday I jumped the gun and got the Tatami Tan and Fiery Brown combo. Since you have done many doors like that, I assume it will work out. The garage and front door will both be done the same way. Is it possible to wood grain vinyl shutters? Ours are raised panel, not louvred and the thought came up. If this is an option, what prep work is involved? As far as I know you can use the same technique with the shutters. I am trying to quote a family member for their garage doors measuring 8' X 16'. I was trying to figure out about how long this process will take, about how long would this take you? This would be my first time with this exact process, but I am a painter and catch on quickly. Could you help me to answer this? That sounds like a double car garage door. I allow myself 4 working days for a double door. Hope this helps. I really don't use a glaze for my garage doors. I thin with water. Hope this helps. Great blog! Thank you for your wisdom on oil based products, everyone else recommends them. 1) primer....you mentioned that primers can be tinted to the base coat color but later said you use SW p6 dark gray, can you do either? If you get the primer tinted to the base coat would you still need to do a base coat? If not, then isn't that time saving? Or do you recommend the gray and then the base coat? I have never primed so I'm confused do I get the primer in the base coat color or do I just get a gray primer? 2)Have you ever used a more yellow/gold base coat? I think I want something a little more golden, but not too much-my house is a dark red brick, so I think I need a LITTLE contrast so the red doesn't just blend all together. I'm worried that the mahogany will just look like a brown door, and the cherry would look like the brick. Any luck on getting pics and color combos posted? Have you ever done a door for a dark red brick house? I used to tint the primer the color of the base coat but have stopped doing that and now just use a gray for the primer. The reason is about 99% of the doors I do start out white and I find that using a gray primer color then the base coat hides the white better than just using a tinted primer like the base coat. As far as color of base coat goes I have used some very bright golden colors so yes on that. I always recommend a sample board first to see if that is the color you want. Hope this helps. I want to create a medium oak color. What colors would you recommend? I would try out several on a sample board first to see. Probably start with SW Tatami Tan then use Java over that and see if its ok or too redish or not. If its too redish I would have to go with a brown with a little less red in it. Sometimes it takes me several colors to match something. When I do the vertical strokes for the wood graining, I will be stroking down over factory applied "embossed" grain that runs horizontal. Is this correct? I just want to be sure that I am to stroke across that grain on the door. Thanks so much! 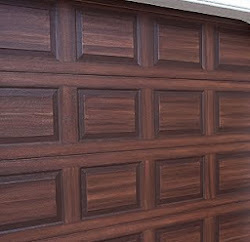 Have you ever used the waterbase stains for your woodgrain faux finish on the garage doors? Was curious on how it would blend with the acrylic base paint. No, I have never tried using waterbase stains. Sorry. How much paint do you need for the primer and base coat? I bought a quart of each, and ran short on the primer, I'll be going to get some more tomorrow from SW, but I'm worried a quart of the base coat won't be enough. My garage is a double (I guess-I have a hard time believing two cars could fit, but it's bigger than a single). I'm wondering if I need more than a wuart of base coat? Does the primer have to be perfect and streak free? I got the whole door covered but not as solidly as I'd like, but I have never primed so I'm not sure if it matters??? It does not matter if the primer is streaky. I have never primed a door without the primer being streaky. Lifted from Wikipedia; Primer is a paint product that allows finishing paint to adhere much better than if it were used alone. For this purpose, primer is designed to adhere to surfaces and to form a binding layer that is better prepared to receive the paint. Because primers do not need to be engineered to have durable, finished surfaces, they can instead be engineered to have improved filling and binding properties with the material underneath. Applying the basecoat you will see how much better coverage you get with paint as opposed to primer. I made a little video of me applying paint over primer. The primer I used was the Gripper from Home Depot and I had them add 2 ounces of black to it which makes it look like a light gray but for some reason it looks blue in the video. Regardless you can see how I apply the base coat with a small roller and then backbrush it. By the way I am thinking one quart of base coat should do the job but I always buy gallons as I do a lot of doors. A little streaking in the base isn't going to matter either as long as its minimal. okay thanks that's a great tip about rolling the pain on and then back brushing. I use my brush and it took forever and I ran out of paint. By streaky I mean the white is showing through the very dark grey primer. I think I'm going to get some more primer and use a roller and brush, I don't want to risk it coming out uneven. Using the roller should make the paint stretch further. Thank you so much! The white will show thru on the primer and be streaky I would not worry about that. It would be really hard to get a totally solid coverage with one coat of primer but that's all you need is one coat. Thank you for your detailed instructions and answers to comments! I would love to do this to my door but I have a problem. It is a galvenized steel door which is past the chalky paint phase and is peeling all over. I've been told to power wash the paint off and apply a clean metal primer before painting. Have you come across this problem on a galvenized steel door before and is this what you would recommend? Thank you in advance for any assistance you may provide. I appreciate it. Carrie, I would be very cautious about power washing a garage door. The reason is a typical garage door is made from very thin metal and a typical power washer is very strong. The powerful water stream could make creases and marks on the door but not take any paint off at all. The only doors I have seen that have paint peeling off are doors that were painted with an oil paint or had an oil top coat over them like a spar varnish or marine varnish. In which case you need to get all that off before you repaint. I use a product called SmartStrip that I get at Sherwin Williams stores. Its non toxic and does a great job of stripping off the old paint but its a big project and very messy. Sorry, I wish I had better news for you. That's okay. Thank you for the SmartStrip info. I will definitely check it out. Robert, thank you so much for posting this! My door is looking beautiful. I'm confused though on the vertical and horizontal spaces around the panels. Did you paint them the same way as the panels? A light coat of brown and then mixture? Thanks! Yes, I paint all the areas the same. Do you use a satin sheen for the clear coat as well? Yes, I always like the satin sheen the best and so do all my clients. I have a 2 car garage and 1 car garage I will attempt to Faux for the fist time. How many gallons should I buy for the following? Beautiful work Robert! I'm in the process of having a new construction home built. It has a gorgeous Craftsman style front entry door. The only problem is that the garage door is an 'almond color'. I was under the assumption that the garage would be pure white. But the builder said that almond is the standard color for all their garage doors. I just don't like it. So I thought it would be a good idea to paint the garage door with a faux wood finish to closely match the front entry door. I came across your tutorial and feel I can do it - hopefully:) My only concern is the upkeep on a painted garage door, especially one that involves this much detailed work. How well will it stand up to the elements? Thank you Robert! I have been painting garage doors to look like wood for over 8 years and they seem to be holding up well. Main points are to use exterior acrylic house paint and never use an oil based product. Hope this helps. Without seeing the door it sounds like an oil based product was used on it at some point. My guess would be the top coat. I have seen it many times when someone uses an oil based clear coat like a spar varnish or marine varnish over a garage door. That will make the door end up getting cloudy and cracking and peeling. If that is the case then the only way I know of to solve the problem is to strip off all the product that is on the door. It is a very time consuming and messy project but if you leave any of an oil based product on the door it will eventually want to crack and peel. If the door is a typical metal garage door I would use a product called SmartStrip. It's a non toxic product that Sherwin Williams sells. If the door is a composite or wood you could sand it off. Any way you go it's a big project. When you read the written instructions on this page you will notice that I vigorously point out not to use any oil based products on a metal garage door. Once it has been done I know from others experience that if you scrap and paint over the door without removing all of the existing paint products on the door the finish will still keep cracking and peeling. I know that is not what you wanted to hear but unfortunately that is what I think is going on with your garage door. I totally disagree with the oil based products. Any oil based products used on a garage door will make it crack and peel within a year. Plus all garage door manufacturers will void the warranty on the door if an oil based product is used on it. I have personally talked to the tech depts of all the major garage door makers in the country and they have told me using an oil based product will void the warranty on the door. I just figured out to paint the wood grain by myself thru trial and error. Hey there Robert just had a question on the clear I bought the modern masters supreme clear in satin instead of brushing it on can I spray it instead ? I have never tried to spay it on. It's really thick so I am not sure how that would go. It's much thicker than regular paint so it might not spray very well. Just had a question Robert on the type of shine you use on the paints ? Flat,semi gloss,eggshell,gloss,or satin thank you . I always use a satin sheen level. I much prefer it so do my clients. Hope this helps. The 2colors that u use for the wood graining after the primer and the coat of tan. Those next two wood grain colors is that reg latex paint too or a stain of some kind? 1) Can this be done over a previous gel stain? if so, do I prime, paint the door the tatami tan, then do the fiery brown and then the black bean? How long does each need to dry for? 2) Is the fiery brown and the black bean just regular acrylic latex paint or is this a stain? 3) Can the primer be tinted the tatami tan and then skip the base coat, so just prime and then do fiery brown and black bean? 4) Since I have already purchased the acrylic latex paint and colored it just an off white, can I use the same paint to have re-tinted the appropriate colors above? They also gave me flat paint, eek is that ok? 5) Instead of mixing 2 colors to get that 2nd dark brown coat, which is more equivalent to your tricorn black and brown mix – the black bean or Turkish coffee? 7) Lastly, is this going to be impossible for an amateur to do? Sorry for all the questions, I really appreciate in advance your help. Your tutorial is making me feel like I should go for it instead of just painting the garage a flat color… I was doing this on my front doors too, they are steel, do the same rules apply? Kristen, I only use Sherwin Williams Superpaint or Resilence. A 100% acrylic exterior paint. Hope this helps. thanks...are you able to look at my other questions? I know I asked a lot and im sure you are super busy.. just don't want to screw this up. Question for you. I have an alder front door that was stained and had a spar varnish on it. It didn't last but maybe 3 years and had to be redone. A Kwal Howells paint store told me that the best top coat I could put on it was pretty pricey but was "bulletproof" and it was a waterborne poly. I completely chemical stripped the door and started from scratch. Applied the poly and after 4 years, it is failing again and pealing off. I am going to re-do the door in the next little while and any tips or suggestions that you could give to keep it looking great would be appreciated. It is a south facing door and is exposed to 110 degrees in the summer and below 0 in the winter. Thanks for the awesome tutorial. Shane, I started to reply to you but it became way to long for here so if you email me directly I will answer. Hi Robert - I just installed a Craftsman style front entry door in a cedar finish. I think it would look awesome if my garage door tied it with that. Any thoughts on creating a 'faux cedar' finish? Thanks kindly! Are you talking about the cedar that has planks that are like half a reddish/orangish and then will have half a blonde color in them. Without seeing a picture of the wood it's hard to say but if it's like the kind with the two distinct colors I would start with SW Blonde as a base and then try SW rugged brown for the darker color. Send a pic and I might have a better idea. If I had a job like this I would work out the colors on a sample board. I just finished a job this week and it's my current blog posting where I had to match painting white crown molding to other wood in the room. So I ended up mixing fiery brown and terra brun brown together to get the right color. So what I am saying is without trying on a sample board you are just guessing but you need to narrow down the colors. First is get the base right and in a classic cedar the blonde might work out well. Awesome! thank you Robert. I will send you a photo of the my door if that's okay. Thanks again! Robert, Thank you for the wonderful tutorial! I have a couple questions. 1.) I live in Minnesota, do you think the paint will hold up in my climate as well as it does in Florida? Any special instructions for a cold climate? 2.) If I decide to go with a solid color (slate grey), instead of a faux wood finish, would you still recommend a satin sheen for the Superpaint and Masterclear Supreme? When I look at garage doors in my neighborhood they appear matte to me. I would like your opinion on what would look best for a solid color door. If you want to paint your door a solid color just use regular exterior house paint. You do not need to seal it. I clean the 2.5 inch angled brush I did the whole job with and use that. I don't like using a roller even one of the small 6 inch ones. Does thinning the paint with water make it more likely to fade? I bought a high quality paint but several people at the paint store told me water will compromise how long it will last. I live in Florida with a sunny exposure and don't want to stretch it out too far....thoughts? I have been using this technique since 2006 and have not had a call back on fading yet. But then again I always use the UV clear coat on top. I also live in FL and my garage faces south so lots of sun. I painted my own garage door and never sealed it for 4 years. No fading at all. If you want to know how much a paint store employee knows about painting garage doors, ask them what clear coat to seal it with. 10 out of 10 will tell you some sort of marine varnish or spar varnish. Both of which will void the warranty on the door and crack and peel in 6 to 9 months, especially in FL. I know because about 4-5 times a year I go to look at a job and its a garage door that someone has painted and its cracked and peeling. I can see right away they've used an oil based clear coat on it. When I ask them why they used that product they all say that's what the paint store told them to use. Hey Robert just had a question on the modern master clear how many coats do you apply on your doors ? And also wanna thank you for the great tutorial you have and answering all my questions my door came out great thanx again. I only use one coat. It goes on really thick as you will see. Thank you for your info on how to but my question is after base and first coat of fiery brown do you mix black bean and Turkish coffee for second coat or mix all three and water down? Did not quite understand 2 nd coat. Thank you! For the second and darker coat there are two ways to get the darker brown. One way is to mix the Fiery Brown with Black. The other way is to use a premixed color like Turkish coffee or a even darker one Black Bean. Hope this helps. What a great tutorial. I can't wait to try it. I was curious about the test boards for trying to find the right color. Would you recommend doing all four coats(primer,base, first and second coat) on each test board? Yes is the short answer. If you can wait a week or so I am getting ready to publish a totally comprehensive tutorial with lots of pictures and videos. I should have it ready here by next weekend. Hi Robert. I'm wondering if you can help me. 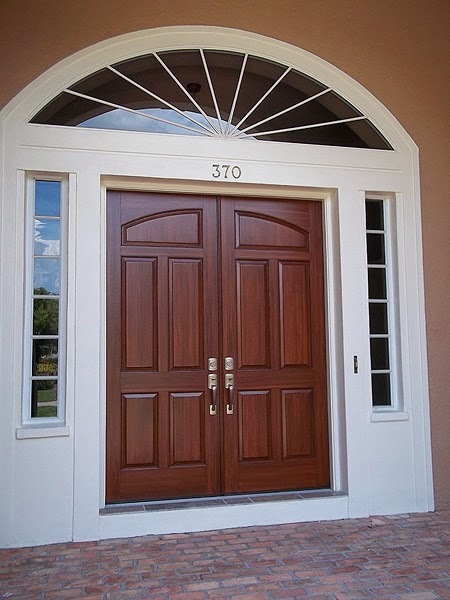 I have 2 exterior front doors that I want to paint to look like a cherry/mahogany look. I love benjamin Moore colors though. Can you give me the colors to use for the base and then for each coat? Also, does this process give the door a wood grainy look? All paint stores mix each others colors. So when you go to the Ben Moore store just tell them to mix you the SW colors in their paint they will. For a cherry/mahogany look I use SW True Penny as the base, then Fiery Brown for the first brown color and then Turkish Coffee as the second and darker brown color. Here is a link to some front doors I painted. http://www.everythingicreate.com/2013/07/faux-paint-entry-door-to-look-like-wood.html . Looks like wood grain for sure but I am sure if that is what you mean. By the way I am going to publish an exhaustive new tutorial this week on painting with this technique. It has lots of photographs and short videos explaining the process in detail. So if you are thinking about painting your door it will be worth it for you to wait a few days and take a look at the new tutorial. Thank you I have 4 doors to paint and they are all smooth doors with no panels except for one. Should I still wait for the tutorial even though they are mostly just smooth surfaces? When I paint a door that has a smooth surface all they way across I divide the door into 5 vertical planks. you can read about it here http://www.everythingicreate.com/2013/09/painting-front-doors-to-look-like-wood.html you can see in one of the pictures where one plank is not painted yet. hope this helps. ok so would you mind giving me a quick breakdown so i can pass the instructions over to my painter who is coming the end of the week. they are doors that have been painted multiple times already and i am not looking for a big job of taking off all the old layers. i just want to get as close to a mahogany/cherry look as i can color wise. so if i tell my painter to put a base coat of true penny then apply a coat of fiery brown and finally top it off with turkish coffee, does that seem to work fine? the doors themselves are either aluminum or fiberglass i have no idea but they are pretty old and i dont think dividing them into planks will have the desired effect. any thoughts? Complete and very detailed instructions are available above. Hope this helps. Thanks Robert! One last question. 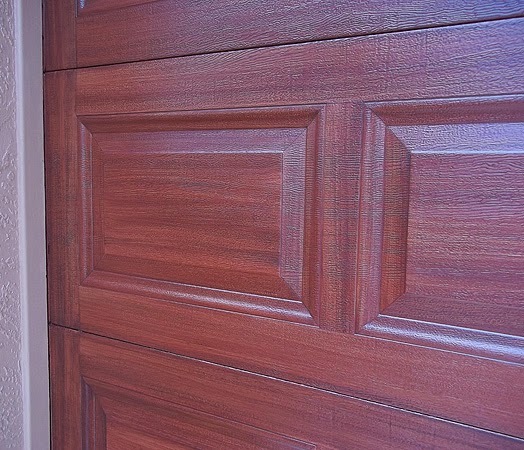 My doors are now a dark walnut. Do you think one coat of each of the 3 colors will have the desired effect? Or do you think I should put 2 coats each of the true penny, fiery brown and coffee? You only need one coat of each color, don't forget to clean and prime first. I sent you a longer email. You are a genius!! my garage door came out great!!! I follow everything on your tutorial..word by word..Thanks! Thanks ! Thanks! A happy Mom! 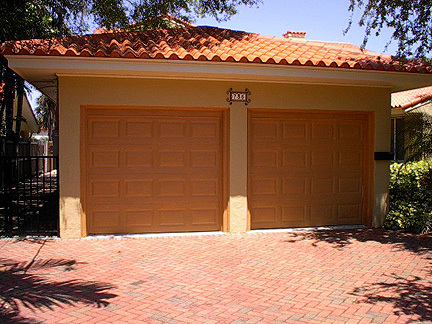 What Colors and Brands did you use in the garage door pictured above? Is it necessary to go over it with a clear coat since it is an outside door? If you are talking about the first big picture on this page the base coat of paint is SW (Sherwin Williams, Superpaint) Toasty, then the first coat of wood grain color is Fiery Brown and the Second coat is Turkish Coffee. You don't need to clear coat it but you will get an overall better look and better performance if you do. Hope this helps. Do you live in Central Florida? Do you know someone that can paint my garage door in Orlando. I'm a handy person, but certainly hate to paint. Sorry, I do not live close enough to work in Orlando. A suggestion would be if you find someone that is a faux painter in your area you could purchase my tutorial on how to paint your garage door and let them read it and by following my instructions and I am sure they could do a good job. Hope this helps. What colors would you recommend for a rosewood color? Only once I have been asked to paint a rosewood color. The client had a wooden bowl that I was told was rosewood and to match it I used a SW color 6370 called Saucy Gold as the base coat color. Then I used SW Fiery Brown as the first coat of brown, then Black Bean or Turkish Coffee for the darker coat. It seems to me that rosewood is very yellow-orange in color cast. I looked on google and bing for images of rosewood and its pretty wide what they have. If you send me an accurate picture of the color or piece of wood you are trying to match I might have a better answer but based on my own experience that is what I used. Hope this helps. My name is Julia and I'm new at these postings. I can't seem to figure out how to send you a picture? I'm trying to match my garage door which is rosewood. I would like to paint my entry door to match it. Do you have an email I can send picture to? I just purchased and finished reading your guide and it seems fantastic. Quick question though, how has your experience been with painting on smooth metal garage doors... all the photos in your guide all have factory wood texture. My garage door has raised panels but is just smooth metal, no texture at all. Thanks in advance. Doug. It actually looks really good to have no texture on the surface. I have not done any garage doors that were smooth but I have done several entry doors. http://www.everythingicreate.com/2013/07/faux-paint-entry-door-to-look-like-wood.html is one. I am painting garage doors and have used stains for the last time. Now using satin latex paint. Will be using the masterclear supreme clear coat. Do you use a specific ratio of water to paint for each coat? I am not really sure what the exact ratio would be but I typically thin the second coat of darker brown more than the first coat of brown. I do have a few videos of me showing how I thin down each color so you can see the viscosity of the result. They are in the tutorial along with the other videos showing how I go about painting a garage door to look like wood. I always advise working on a sample board to practice your paint stroke and work out how much you want to thin down the first color. If you have never tried anything like this before a sample board is highly recommended. Most people are surprised at how good they can make a board look like wood with just a little practice. I'm new at ordering online. pd for written instructions and videos. how long until receive in mail. When you order the tutorial online you will get an email. The email will have a link. You click on the link and it will download the tutorial to your computer, most likely in the 'downloads' folder unless you designate to go somewhere else. If you have any problems at all with this please let me know so I can make sure you get it. The tutorial is only available by download. Once you download it you can click on it to open it up. It is a pdf document and will open on your pc, tablet or phone for you to read. The videos are hosted on youtube so when you open it up make sure you have an internet connection and then click on the link for the video and it will take you to youtube to watch the video. Let me know if you have any problems along the way. What colors would you mix to get a nice Mahogany color. We just purchased a Mahogany door and our garage door is white. Yuck. So I am intrigued and anxious to try this out. I have my fingers crossed that I can be proud to flaunt the work after. For a mahogany color I use SW Toasty as a base coat color, then the first brown color I use SW Fiery Brown, then the second color I use is SW Turkish Coffee. That pretty much looks like most mahogany doors. You have to play with a sample board to get the right mix to match your front door but that is where I would start. Hope this helps. By the way the first two pictures of garage doors on this page are the mahogany colors I use. Not the picture in the right sidebar but the first two in the main column. Thats what intrigued me to look into this site. The door looked almost the same color as what I wanted. I just bought the book. Will be trying it out on our side entrance door first. Then attack the garage door once I have one under my belt. Boost my confidence a bit :-) thanks again! I just completed my first day of putting wood grain on half my garage door. It was just too hot to do the rest. It is GORGEOUS!! I purchased your tutorial for the minimal fee. I read and viewed it 20-30 times and finally bought the paint and supplies. SW does not make superpaint in quarts any longer. I was concerned about using their other products as they have a faster dry time. the closest supplier for the sealer is 200 miles away so the internet is the best option. the painting goes quick, it is the taping that takes time, and this is what makes it look so great. I added knots by using a dab on my pinky of undiluted paint and making a swirl with a tail (like a comma) and then letting it dry and doing the first and second coats around them. I completed my double garage door and it is astounding. I did the adjoining man-door today and it is even more spectacular. I have plans for the front door and the second man door to the back of our garage. I am looking for more projects. My neighbors are dumbfounded at the beauty. My husband is speechless. Our contractor is wanting to hire me. I guess my years of wood refinishing are over. Wow, that is great. Thanks for sharing, you put a big smile on my face. I continue to be astounded at how beautiful my doors are. I have one that is in full sun for all day in south exposure (including reflection off of winter snow) and it is holding up very well. My father in law, who is currently dying, was able to see it recently and he is amazed. He is a master woodworker and he had to go up and touch it to tell that it was not wood. Thanks for sharing, great story. Yes, all the garage doors I paint have a textured wood grain on them. THANKS a LOT! I am anxious to start. I wish to have a GRAY BROWN Walnut look- no red no gold- . Wich colors do you suggest ?? Tatami + Toasty + Java???? I would go with the Tatami Tan as the base and then Java for the first brown color and then Black Bean for the second and darker brown. As always I suggest you work out the colors on a sample board first. Hope this helps. In speaking with the technical rep at modern masters they said that the master clear supreme does have uv protection but that it will yellow and within a couple of months. have you found this to be an issue long term or is it slight enough to not be noticeable? Sherri, I have been using the master clear supreme since it came on the market and have never noticed any amber but then again I only use it over doors I have painted to look like wood and a slight amber over the wood tones probably would only serve to enhance the beauty of the wood look. Hope this helps. what tips do you have for achieving a consistent color? I did a sample board as you suggested. It's the diluting the paint each time I begin another panel that concerns me that the panels all won't look the same. I'm thinking I should apply less paint and go back and darken if necessary. Getting a consistent color tone can be a challenge but you are right about going light then go back and darken up here and there when you are all done. I work that way myself. I typically tape off two rows at a time and then put the first color of the wood grain on then get back and see where or if I need to adjust it. You can only go darker once the paint has dried so better to go light then darken up here and there where needed. Now here is another tip along these lines for you. Often when I tape off the two rows I am working on I tape off maybe two panels on a third row. The reason I do that is this. I go ahead and paint on the first brown color on those extra two panels. Then I do not paint on the second color brown on those. Those extra two panels are my 'guide' if you will for the next two rows for the first coat of brown. See what can happen is you paint on both colors of brown on the first two rows and then when you go to do the last two rows you might not have a guide as to how much paint you used for the first color brown. So if you have at least 2 panels (that's all I use) as a guide for the first color of brown then when you tape off the last two rows you will see how dark to make the first color of brown so it will match the top two rows. Keep in mind while working that the acrylic or latex paint dried is darker than wet. So what means is when you go to match the bottom two rows using the extra two panels as a guide they will be dry and the new wet paint will be lighter because it is wet. So do not go as dark as the dried panel you are trying to match. Go lighter and when dry if it needs to be darker go back and darken some. thank you for that insight. This is where you truly are an artist to pick up just the right amount of paint on your brush for consistent, even coverage. One last question, is there a way to test if I like the picture framing look? My beveled edges are possibly too large - I'm not sure. Thanks so much. J.C. I personally think that if your beveled edges are over 2 inches that is too wide for the picture framing. To Test you have keep in mind that once you paint on the door darker and you don't like it then you have to start over for that section. But instead of painting on the door I would take some paper or cardboard and paint it dark and then cut some strips and just tape them up around a panel and get back and see if you like it. Use the low tack tape of course. Hope this helps. Very helpful person Mr.Robert , yes an artist and is passionate on his craft. I purchased the book and honestly it is a must read and has lot of well written easy to understand information and its DEF worth it . I had Robert help me along the way when I emailed him he always was there to help . I painted my front door and it came out amazing!! I will be starting on the garage door this week. 2) Ask questions to Robert if you need any help . 3) DONT think you cannot do it , I have painted but never painted a garage and front house door. This is possible and it honestly feels so good when you do it slowly yet steadily after your practice boards or even bristol boards or dry walls you can practice a few times you will get a understanding and get the hang of it . Anyone can do it . Go for it! That's awesome! I was searching for something else and it linked your picture. Do you think of or are you aware if the same technique could be used with furniture (laminate or other)? Yes Janie, I use the same steps to paint entry doors and kitchen cabinets. In fact I am working on a kitchen cabinet job right now using the exact same steps. in reply to Ms Janies question of use on furniture: I have used Roberts tutorial and have done many doors and garage doors to my house. This last year I was repairing an antique buffet with leg damage. The finish was in decent condition but the base of the tiger oak legs required significant repair. I did not want to have to patch in a piece of wood to match as it would not look good. I eventually decided that a wood epoxy would make the best structural decision and I was confident that my ability to use Roberts method of faux wood painting would work. This was done with tiny artists brushes and it looks great. Thank you Robert for your great teaching, I would love to meet you in person some day. Hi there Bob -- I am considering purchasing your tutorial. I am having my original old wood garage door replaced with a new steel one. Do I need to scrub the garage door as much if it is brand new? Also, it is in constant shade. I would wash the door with plain old dish soap and a scrub pad first. All doors come with a film of something on them so you need to wash it. Just wash it off like you were washing your car and that will be fine. One thing I will mention is once the door has been washed and rinsed off with the hose the water will rest in the seams some. So what I do is open the door so that as it goes up and the seams opens, stop the door then and dry that seam with a rag. If you don't water could leak out of the seam and run down the door after you have just primed it and put a run mark in the primer if it hasn't dried yet. I dry the seams out because I need to keep going but if you wash the door one day and then work on it the next the water in the seams will be gone by then. Sometimes it runs out when you open and close the door too. It's great that the door is in the shade, makes it so much easier to work on. I just finished a door 2 weeks ago that was in the shade all the time and it was a pleasure to work it plus without the sun hitting it the paint job will last a really long time. If I wanted to add a redder tone like mahogany, what color would you recommend. For a mahogany look I use the SW (Sherwin Williams) color Toasty for the base coat, then I use SW Fiery Brown for the first color of the wood grain and then SW Turkish Coffee for the darker color brown wood grain. For a more reddish look than that I use SW True Penny as a base. Here's a link to one I did recently with those colors. http://www.everythingicreate.com/2016/04/arched-garage-doors.html . I used the True Penny as a base then the Fiery Brown, then the Turkish coffee for the darker grain lines. I am looking to use this technique on a vinyl beadboard soffit for an outdoor patio. I purchased the Toasty, Fiery Brown and Turkish Coffee. The Toasty rolls on with no problem but the wood graining colors need to be watered down. You never specify how much to water each one down (2:1, 3:1, etc.). Every time I do a sample, the Turkish Coffee turns out too dark, almost covering everything done previously, regardless of how much I water it down. Can you be more specific on how much to water down each of the wood graining colors? Hi Robert. I read through your ebook, and read through most of the posts but can't find an answer. What colors should I purchase to get a 'Chestnut look'. P.S. I'm glad I purchased the book. You do a fantastic job laying out the details, and I really think I can do this! I am sure what Chestnut looks like so if you could send me a picture I could better be able to advise. But I would imagine that using a SW Tatami Tam as a base and then Java as the first color and then Turkish Coffee as the dark brown color would get very close. I hope this helps and good luck with you door. Have you done anything like this? Do you have any paint suggestions? Thank you! The base coat I used was a Sherwin Williams color called Tiki Hut SW 7509. Then I only used one color for the wood grain and it was a warm charcoal color I had custom mixed. But for the pic you referenced i would use SW 7054 for the wood grain color. As always try these out on a sample board. Also for a more weathered look you can use a 'dry brush' technique over whatever you have done to give the wood a more weathered look. Yes, that is exactly what we are shooting for. Thank you so much! We would like to do a lighter look like cedar, what colors would you recommend for the base coat and the other 2 coats? Then I used SW Java as the wood tone color. I thinned that down a lot to get the light wood tone of this door. Then for some darker grain lines I used SW Turkish Coffee but very sparingly. With cedar I think you'd want some redish color also so I would some SW Fiery Brown for that. Cedar is a light wood so you have to thin the colors down a lot. When you are doing your sample board if you aren't getting the color you want let me know and send a pic of what you are trying to match. Can you provide some measurements of how many parts water vs paint to thin it out to get the lighter color we are looking for? Thanks for your help and the quick response. You can use water or floetrol to thin with. I always recommend a sample board to work it out on. Start with a 1:1 and see how that looks. You have to use a dry brush technique mostly so not much product on the brush. If that's too hard to master try using a lighter color instead of the Java, like SW Jute Brown. Some people like to thin with the Floetrol because it has more body than just water. Hope this helps. Thanks for all your help Robert. Robert - What would be the ideal paint colors to achieve the same color/look as Ready Seal's Light Oak wood stain? Looking at the picture of that stain online I would try a Sherwin Williams color called 'Totally Tan' SW 6115 as the basecoat color. Then the first color of wood grain I would try Sturdy Brown SW 6097 and then the second and darker brown for the dark grain I would use Black Bean SW 6006. You will need to thin down those wood grain colors quite a bit to get the look you are going for but those should be close. Hope this helps. Thank you! Btw, I just purchased your tutorial!